WASHINGTON – As he seeks to convince his colleagues he is worthy of being the next U.S. attorney general, Sen. Jeff Sessions, R-Ala., will cast himself as an old-school law enforcer who will crack down on violent crime, work to improve morale at local police departments and remain fiercely independent of the president who appointed him, according to a prepared copy of remarks he will make at his confirmation hearing that begins Tuesday. Sessions will highlight increases in violent crime in some areas of the country and assert the United States might be at “the beginning of a dangerous trend” that could make America less safe, according to the remarks. He will promise vigorous prosecution of gun crimes, and express empathy for the civil rights struggles of African Americans. The Senate Judiciary Committee rejected Sessions for a federal judgeship in 1986 amid allegations of racially insensitive remarks, and civil rights advocates and others have mounted a vigorous campaign to deny him the attorney general post. But he is expected to win confirmation. Sessions will also assert independence from President-elect Donald Trump, the man who appointed him to the job. The attorney general, he will say, “must be committed to following the law,” even when that means coming into conflict with the president. Sessions’ two-day confirmation hearing, scheduled to begin at 9:30 a.m., will likely be among the most hotly contested of all those for people Trump has nominated. Sessions has taken controversial positions on immigration and the rights of LGBT people. He is alleged to have made racially insensitive comments, and he once unsuccessfully tried to prosecute civil rights activists for what he alleged was voting fraud. Sessions will also address issues of policing, asserting that officers have come to feel “abandoned” and unfairly blamed for the actions of a few in their ranks. Sessions will cite violent crime statistics, such as Chicago’s 4,368 shooting victims in 2016 and the 11 percent jump in murders nationwide from 2014 to 2015 – and promise that he will make it a priority to turn the tide. Sessions will be introduced by fellow Sens. Richard C. Shelby, R-Ala., and Susan Collins, R-Maine, then offer his statement take questions. After that, 15 witnesses will speak about Sessions, including a former attorney general, the president of a national police union, and several civil rights and other advocates. Late Monday, the Senate Judiciary Committee revealed that one of Sessions’s own colleagues, Sen. Cory Booker, D-N.J., was expected to testify as a witness against Sessions. Sessions is considered one of the more well-liked members of the Senate, his polite and respectful style having won over colleagues whose political views differ from his. Democrats are thought to have little chance to flip any Republican members against the nominee. Collins, for example, might have been a target because of her moderate views, but she is among those leading the effort to get Sessions confirmed. Sessions will appeal to his fellow senators’ familiarity with him. That is not to say those opposed to Sessions will let the hearing pass without a fight. A group of more than 1,100 law school professors from across the country sent a letter to Congress urging legislators to block Sessions, and six protesters from the NAACP were arrested last week during a sit-in at his Mobile, Ala., office. The NAACP’s president, Cornell William Brooks, who was among the arrested demonstrators, is expected to testify at the confirmation hearing. So, too, will David Cole, legal director of the ACLU, which takes no formal positions on whether nominees should be confirmed but issued a report critical of Sessions. Sessions also will likely be questioned about his views on immigration. In the Senate, he has fought efforts to reform immigration in any way that might benefit those in the country illegally, and he has advocated moderating the flow of those coming to the U.S. legally. He could, as attorney general, increase enforcement of the illegal entry statute and help the Trump administration abandon an Obama executive action that allows people who came to the United States as children to receive work permits and a reprieve from possible deportation. LGBT advocates say Sessions’s record is similarly worth scrutinizing when it comes to the issues they care about. In 2009, for example, Sessions opposed a bill named after Matthew Shepard, the gay college student who was murdered in 1998. The bill extended federal hate crime protections to people victimized because of their sexual orientation or gender identity. Civil rights leaders hope that legislators will question Sessions on his views on the landmark Voting Rights Act – which he has called “intrusive” but “necessary” – and a voting fraud case he brought against civil rights activists when he was U.S. attorney in the 1980s. On Monday, the NAACP Legal Defense and Educational Fund submitted a 32-page report to the Senate Judiciary Committee calling on the Senate to reject Sessions. “For more than 40 years in public life, Jeff Sessions has demonstrated unrelenting hostility to civil rights and racial justice,” said Sherrilyn Ifill, president and director-counsel of the Legal Defense and Educational Fund. Sessions’ office charged the activists – now known as the “Marion Three,” after a town in Perry County, Ala. – with tampering with absentee ballots cast by mostly elderly black voters to favor one faction of African American candidates over another. Sessions has said he believed the prosecution, which was approved by the Justice Department, was “well founded,” and he denied accusations that he was seeking to suppress black turnout. A jury of seven blacks and five whites found the defendants – who faced decades in jail – not guilty. Sessions’s defenders argued the comment was a joke, made in the context of a case in which Sessions was prosecuting members of the white supremacist organization. But a black lawyer working in his office did not see it that way and told Congress he was deeply offended. Sessions, though, has no shortage of supporters, including law enforcement groups and the National Association of Assistant United States Attorneys. 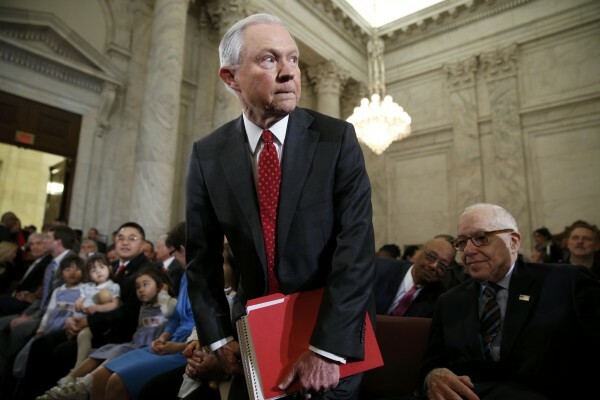 Former attorney general Michael Mukasey and former deputy attorney general Larry Thompson are expected to testify in support of Sessions at the confirmation hearing. Collins, who will introduce him, said in an interview with The Washington Post that she felt the criticism of her colleague was misplaced.